What do you think about Segara Permai website? With rising fuel costs and today’s global interest on emission reduction, liquefied natural gas (LNG) is considered a promising alternative fuel for all type of ships. In response to industry’s need for technical guidance for new construction and existing vessel conversion, leading class society ABS announced today the release of its Guide for Propulsion and Auxiliary Systems for Gas Fuelled Ships. The new ABS Guide, considered to be the most comprehensive available to the industry, provides criteria for the arrangements, construction, installation and operation of machinery components and systems for vessels fueled by natural gas. The objective of the guidance is to minimize operating risks and promote the protection of the vessel, its crew and the environment. Christopher J. Wiernicki, ABS CEO and President says that the shipping industry needs to examine the issues surrounding the transition from traditional fuels to LNG, to verify that solutions provide an equivalent level of safety and reliability to those established for LNG storage and transportation. “With ship operators facing economic pressures from fuel costs combined with impending regulations aimed at reducing exhaust gas emissions, particularly for sulfur oxide (SOx), LNG fueled propulsion systems could be a practical and beneficial solution. It is a matter of when, not if, LNG will be a commonly-selected fuel source and we need a sound basis for ship designs,” says Wiernicki. More than 50 years of ABS’ experience with the handling and storage of LNG on board ships, many with dual-fuel diesel propulsion plants was incorporated into the Guide. Consideration was also given to industry standards including the IMO Resolution MSC.285(86) Interim Guidelines on Safety for Natural Gas-Fuelled Engine Installations in Ships, the International Gas Carrier Code and the IMO International Code of Safety for Gas-Fuelled Ships, currently under development. Significant contributions to the Guide also came from a joint research project with DSME and A.P. Moller Maersk to develop a LNG-fuelled containership. Concluded earlier this year, the project addressed the design and technical issues surrounding the use of a 7,000 TEU containership burning LNG as fuel for both propulsion and power generation, with ABS providing Approval in Principle for the resulting design. The study also assessed operational, economic and regulatory impacts from the use of LNG as a fuel source. Results from the study were presented by DSME in March during industry’s premiere gas conference, Gastech, in Amsterdam. Found to be of particular interest were the considerations given to the type and arrangement of fuel tanks used to provide the utmost safety for the crew and to minimize capacity reductions. The study found that the initial costs for LNG fueled propulsion could be recouped within a three to 10-year period, depending upon the applied LNG prices. Update 2: We spoke with a lifeboat industry insider today about the specifics of the lifeboat system that ultimately killed 5 sailors. Preliminary investigations are pointing to a failure of the lifeboat hoisting cable. 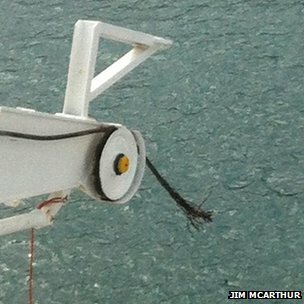 A photo of the cable supposedly taken by a passenger on the ship has been published by BBC, HERE. 5 Kecelakaan Kapal dalam Sebulan,Salah Siapa...? “Saya prihatin. Musibah kapal di Tanjung Perak itu tidak semestinya terjadi,” kata Saleh di Gedung DPR RI, Senayan, Jakarta, Rabu 28 September 2011. Apalagi, ini bukan merupakan kecelakaan kapal pertama, melainkan yang kelima dalam bulan ini. 5 Kecelakaan Kapal dalam Sebulan,Salah Siapa? Sekitar 15 orang hilang dalam kecelakaan Kapal Motor (KM) Putri Ayu yang tenggelam di perairan laut Alang Pantai, Kabupaten Maluku Tengah pada Minggu (17/6) dini hari. Helicopters, ships and an aeroplane searched the waters off Louisiana's coast today for at least 11 workers missing after an explosion and fire that left an offshore drilling platform tilting in the Gulf of Mexico. Segara Permai is Supplier and Trading Marine, Life Saving and Safety Equipment, Service Inflatable Liferaft, Lifeboat and Fire Extinguisher.